"it is alleged that this is the grave of a gypsy boy who, while tending sheep, fell asleep in a dike. In remorse he hanged himself because he feared to return to his tribe"
Unwritten tradition maintains that his fear was founded on his belief that, whilst asleep, one of his sheep had strayed. All however were found to be safe when counted home. Recent researches, would appear to indicate that this story owes its origins to a claim that the original incident was chronicled in the 'Bury and Norwich Post', even giving an approximate date...1841. Substantial research has, to date, failed to identify this account, and part of the original claim verges on pure fantasy. Prior to 1974 the grave was surrounded by ratten cane hoops similar to those used to fabricate the backs of certain chairs. To these, it is alleged, passing gypsies, on their way to Newmarket races, would tie ribbons corresponding to the colours of the predicted winner of the next big race. She has further confided that she selected the Mythical name Joseph because of its biblical connections, being that of Mary's husband. Today it is known that gypsies pay scant regard to the grave, indeed their knowledge would also appear to have been gained from published sources. 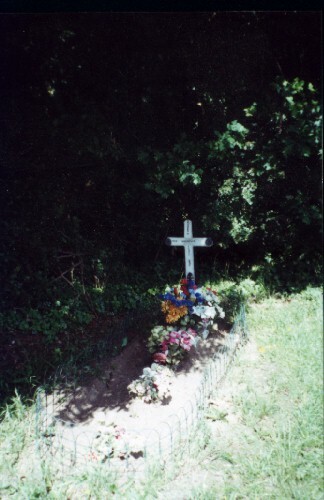 The grave, now surrounded by a simple chain link fence, still bears the simple wooden cross which carries the short epitaph. 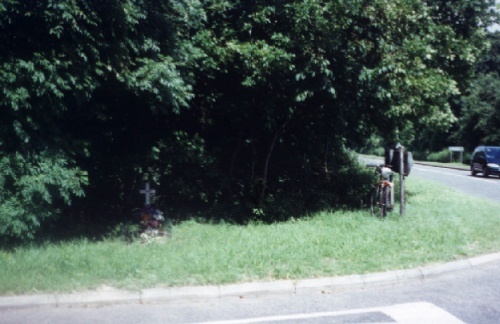 It lies immediately behind the signpost at the crossroads where the Chippenham to Moulton road cosses the one linking Kentford and Newmarket.